In September 2015 Russia deployed a large contingent or air and land forces to Syria. On September 30 Russia launched airstrikes on ISIS, al-Nusra Front and other rebel groups, including ones created and supported by the US. The move came as a surprise to US officials, despite the evidence collected here and despite president Putin's speech at the US General Assembly on September 26. As of October 2, 2015 the Russian strike force consists of over 50 aircraft, including twelve Su-24s, twelve Su-25s, four Su-30s, six Su-34s and a number of helicopters. Initial claims of the presence of six MiG-31s have not been confirmed. As we have been reporting since April, the army of Syria’s president Bashar al-Assad has been increasingly showing signs of collapse, losing one major city after another either to the Islamic State (IS or ISIS or ISIL or Daesh) or to the al-Qaeda linked Jabhat al-Nusra (al-Nusra Front). The collapse has become so serious that even Russia is considering ending support for al-Assad. 12.11.2015. IS issued a video threatening Russia. The Hmeymim airbase on January 31, 2016 after four Su-35 fighters have been deployed. The planes performed over 6,000 sorties in the first 4 months of operations with a loss of one Su-24 to Turkish fighters. 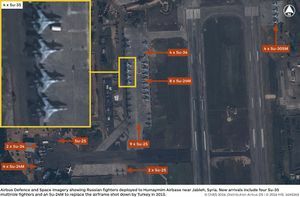 'Satellite image shows four Russian Su-30SM parked in the open air at airfield in Syria', theavionist.com, 20 September 2015. Image appeared on Twitter. It is also said that images were released by Stratfor. SU-30 SM has thrust-vectoring, giving high maneuverability; this is an air superiority plane. A video appear to show four interceptor/fighter planes and a refueling plane in Syria -video. Rusvesna notes that neither side confirmed or denied the report and hopes to clarify the matter later. Now we can confirm that to the best of our knowledge, despite denials Russia has cast its lot and made a very important decision to enter the Syrian war. This decision may yet save Syria from total collapse and incidentally save Europe, too, from being swept by refugee waves. The Russian air force will ostensibly fight Da’esh, but probably (as Michael Weiss guessed) they will also bomb not just Da’esh but the US-allied opposition of al-Nusra (formerly al-Qaeda) and other non-Da’esh Islamic extremists for the simple reason that they can’t be distinguished from Da’esh. "The Russian military have deployed a layered defense system and continue fulfilling contracts for the delivery of modern weapons to Syria. That's all I can say officially. I have no right to either deny and confirm whether the Russian aviation is involved in the military actions," a high-ranking source in the General Staff of the Russian Federation told Politonline.ru. He added that Russian troops have already repulsed terrorists' attacks before, quite successfully. Russia will supply the Syrian regime of Bashar Al-Assad with 12 MiG-29-M/M2 fighter jets by 2017, media reports have claimed. According to Russia’s Kommersant newspaper, the government in Moscow will ensure that nine of the aircraft are ready by 2016. Unnamed sources said that some Yak fighters are ready for delivery. Putin press conference -TASS, full text (Russian) (English) . Among unexpected answers,-- not sure that a Russian base in Syria is a must, 'if we need to get somebody, we can do it anyway' (see an answer to Sergei Brilyov in the full transcript for details). Protecting a long established Russian warm waters navy base in Syria is in general believed to be one of the reasons of Russian involvement, this casts some doubt on that wisdom. Kadyrov claims his commando fighters are taking part in operation in Syria, and had some casualties; and claims that IS was prepared by NATO instructors (he says he knows because his men have joined and passed those training courses)-report and video from Chechnya, Feb. 8, 2016. Video shows training exercises, with Kadyrov taking part; a group of men said to return back after joining IS; a central mosque, where a decision banning wahhabism was adopted; and an imam visiting a men arrested for joining 'illegal armed formations' (possibly in Syria). Video released shortly after controversy created by verbal, media, and possibly legal clashes between Kadyrov and Russian opposition; this is briefly addressed in the video. Video also shows meeting of Kadyrov with Zakayev relatives in Chechnya and offering to return back (Relatives praised the visit by Kadyrov, but Zakayev declined, gave an interview to Echo of Moscow). Prigozhin, see also here and here; all claims as per respective sources. Director-general of Stroytransgaz is Mikhail Vladimirovich Khryapov, right side on this unrelated video (some similarities with VIP photo above, but IMO does not appear to be the same guy, FWIW. Lots of suits on hand to travel, anyway. According to the officials, Russia has sent 12 SU-24 attack aircraft, 12 SU-25 ground attack aircraft and four Flanker fighter jets. At the climate change summit, Obama and Putin have met. The US president once again expressed his stance on the position of Syrian President Bashar Assad, saying that the Syrian leader must leave power as part of a political transition, Reuters reported, citing a White House official. 'The truth about Syria', Undercover behind rebel lines, by Clarissa Ward, updated 16 march 2016. Shows results of 5 years of civil war (Idlib, Aleppo)-blames Russia for everything. (Russia bombed court house, hospital, and fruit market, in particular; no effort made to figure out who is really to blame). Update seems to be, text over video, driving home talking points for dummies, now (after Russian withdrawal) removed. U.S. Readies ‘Plan B’ to Arm Syria Rebels, WSJ, By ADAM ENTOUS, April 12, 2016 9:03 p.m. ET. It is said that when Western-backed rebels were bombed, Russian and US planes were in the same area and that communication failed (quoting CNN report). Urgent consultations between militaries were conducted. The U.S. diverted armed FA-18s to the area after the first round of two strikes, and the pilots then tried to call the Russians on a previously agreed-upon pilot-to-pilot communications channel but did not receive an answer. Russia plans to expand its military force in Syria and deploy jets to a second airbase near Homs, according to a Kuwaiti daily with close access to Moscow’s military intervention in Syria. Al-Rai reported Monday morning that a Russian intelligence brigade would deploy near the Al-Shayrat Airbase located approximately 35 kilometers southeast of Homs. “The Al-Shayrat airbase houses around 45 airplane hangars, each of which is fortified in a way that prevents any damage if it is shelled or targeted,” sources in the Damascus joint operations room of the “4+1” military coalition of Russia, Iran, Iraq, Syria and Hezbollah told the newspaper’s chief international correspondent, Elijah J. Magnier. Russia has expanded its military operations in Syria to include a second airbase as well as other posts, according to a U.S. official briefed on the latest intelligence from the region. Russia has begun operating Beriev A-50 'Mainstay' airborne early warning and control (AEW&C) aircraft over Syria in support of the air group it has deployed to the country. 22 July 2016. Saudi Arabia is ready to offer Russia's economic cooperation with the countries of the Persian Gulf and a major investment in exchange for Moscow's refusal to support Syrian President Bashar al-Assad, said the Foreign Minister of Saudi Arabia, Adel al-Dzhubeyr in an interview with the Brussels edition of "Politico." -Interfax . Putin: by estimates of security services, around 4,000 from Russia and some 5,000 ex- USSR militants in Syria (on the side of the rebels) -TASS, 23 February, 2017. On September 21, Vladimir Putin will meet with Israeli Prime Minister Benjamin Netanyahu, kremlin.ru. Fort Russ: What CBS edited out of Putin's interview: "US is preparing opposition forces to fight Assad, who then flee to ISIS with American weapons"
13.11.2015 Russian MoD denied that S-400 was deployed in Syria. (Photo on Cassad, titled S-400), and by Daily Mail, showed a radar, possibly 96L6, or another version, which may be optional for S -300 and standard for S-400. S-400 and Fort/S-300 were deployed after Russian SU-24 plane was downed by Turkish F-16 on 24 Nov, 2015. Russia sends to Syria missile cruiser "Varyag", TASS, Dec 8, 2015. Russian Air Force strikes ISIS around Deir ez-Zor as jihadists prepare to storm key Syrian city, RT (Engl. ), Jan. 25, 2016. TASS, 12 July 2016. Six long-range Tu-22M3 bombers flew from Russia and performed strikes against terrorist targets in Syria east of Palmyra, Es Suhne and Arak. This is seen as retaliation for helicopter pilots death on 8 July 2016. Putin, October 27. 2016 (improved automatic translation): Stopping the bloodshed and launching the political process fails. It would seem that, after long negotiations, an enormous effort and complex trade-offs a united front against terrorism finally began to form . President Obama has committed the United States to a war aimed at degrading and destroying the Islamic State (ISIS or ISIL). Russia—with the consent of Iran—has moved to block that effort. See also the talk page. As Moscow Sends Fighter Jets Into Syria, US and Russian Defense Chiefs Open Talks -defenseone.com, 18 September, 2015. Date of contact: Friday, 18 September 2015. Netanyahu meets Putin to discuss concerns over Russian activity in Syria - The Guardian, , 21 September 2015. CIA boss Brennan visited Moscow in early March: Interfax -Reuters, March 28, 2016 (preceded partial Russian withdrawal). In one of his televised public appearances soon after the deployment, Putin has stated that Syrian operation was not a surprise to our US partners. A reference to such a statement: interview to Vladimir Soloviev, 12 October 2015. Vladimir Putin: First, let me confirm what is already known, namely, that we informed our partners of our plans beforehand. We informed our American partners and many others, especially the countries in the region concerned, of our plans and intentions. 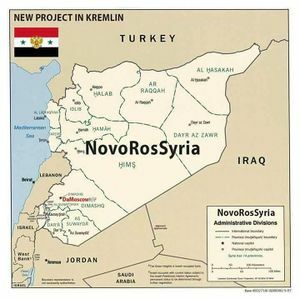 Igor Morozov, member of the Russian Federation Committee on International Affairs claimed about the beginning of the military operation by China against the IS terrorists. "It is known, that China has joined our military operation in Syria, the Chinese cruiser has already entered the Mediterranean, aircraft carrier follows it," Morozov said. Both RT and International Business Times are just quoting DEBKAfile and Leith Abou Fadel without any new information or confirmation to add. "It took Russian military men months to develop the Syrian operation. Everything was elaborated in detail on maps. We started delivering military hardware and ammunition to Syria, the Hmeimim airbase had to be reconstructed. The base had to be protected too, so we had to redeploy several groups of the Black Sea Fleet to Syria. Surprisingly, the US intelligence and intelligence services of other NATO countries missed all that out of their attention." Analysis of new aspects of 'terror wars'. Modern weapons are more expensive than their targets, and using them carry unacceptable risks; while Western covertly supported rag-tag terrorists are cheap. Army cannot defend against this as there is no front line and strikes can occur at any town/settlement where army fighting is very difficult (analogy with cockroaches often made). Recommendations include: going after source, not just some bandits, including closing and protecting borders (using technical and military means); pressuring external supporters; economic analysis; attention to information warfare --with being clear who is enemy in particular. Spends considerable time describing how Syrian local volunteers ('opolchenie'), when they were in place in advance and with properly organised interaction and training with regular army prevented capture of their territory; recommends working on this in Russia, highlighting danger of Syrian type conflict in Russia. Talks about bringing positions of civilians and rulers closer together. Before dawn on Thursday, Sept. 24, Russian marines went into battle for the first time since their deployment to Syria. Russian Marine Brigade 810 fought with Syrian army and Hizballah special forces in an attack on ISIS forces at the Kweiris airbase, east of Aleppo. In addition to their airstrikes, the Russian military advisors that oversee the Syrian Armed Forces’ operations in northern Syria have now taken complete command of the east Aleppo offensive to lift the siege of the Kuweires Military Airport. Notably, the airstrike did not hit ISIS militants and rather resulted in the a large number of civilian casualties. Around October 20 (apparently) Reuters reports, 3 Russian volunteers (not sent by Moscow) killed in Latakia, near Salma, fighting with the SAA. 24.11.2015 Su-24 captain Oleg Peshkov (lieutenant colonel) was killed after bailing out from his plane shot down by Turkey. Marine Alexander Pozynich was killed during search and rescue operation. As announced by Putin, Oleg Peshkov was awarded the title of Hero of Russia (posthumously); Alexander Pozynich was awarded Order of Courage (posthumously) -interfax. Name of the officer was published. Another Russian death announced, Vadim, from Orenburg, Russia. According to Orenburg local media, he participated in fighting in Syria; other details of his death are not given. His service in MOI troops ended and he was discharged 12 years ago. According to Vasilii Panchenkov, MOI spokesman, Vadim was drafted in 2002-2004 and served as a baker in spetnaz battalion 'Vitiaz'. He was discharged after that. His circumstances after discharge were not traced by MOI, and this is not done in the case of other soldiers or sergeants. 11 May, 2016, Homs province, Syria. While escorting vehicles of the Russian Center for reconciliation of warring parties, as a result of shelling by militants, Russian soldier Anton Erygin was seriously injured and later died of his injuries. 19 June 2016. It is reported that a sergeant of 336th Marine Brigade from Baltiysk Andrey Tymoshenko was killed, preventing suicide bomber attack on humanitarian aid distribution place in a desert area of Homs. A video emerged of suicide bomber attack near Palmyra. One soldier has uniform resembling Russian, others are Syrian. It is uncertain whether this is the same event, but commenters speculate that it is. Palmyra is in Homs governorate, so reports may be consistent. (Similar discussion is in Rusvesna article). On July 8, 2016 Russian training military pilots Ryafagat Khabibulin and Yevgeny Dolgin were making a test flight of a Syrian Mi-25 helicopter with ammunition in the Homs region (Syria)," the defense ministry said. "At the time, a large detachment of ISIS gunmen mounted an offensive against Syrian troops to the east of Palmyra and breaking through the defenses, made a rapid dash into the area, threatening to capture the heights." Syrian reserve units that could be redeployed to the area to curb the terrorists’ advance were not available then, the ministry said. "The crew received a request from the Syrian grouping’s command to deliver air strikes at the advancing combatants," it said. "Crew commander Ryafagat Khabibulin made a decision to attack the terrorists. Owing to the Russian pilots’ correct actions, the terrorists’ attack was thwarted." "After having run out of ammunition, the turning around helicopter was hit by militants’ gunfire from the ground and crashed in the area controlled by the Syrian governmental army. The crew died," the defense ministry said. The Russian military pilots were nominated for top state awards. Interfax, quoting military sources, claim that "terrorists" (IS from the context) used US-made TOW missile to shot down the helicopter. In Russian sources, discussion on whether this is Mi 25 or MI 35 (they look similar, but Mi 35 have shorter armament 'wings' and non-retractable landing gear). Not clearly seen on the video either way. 22 July, 2016. Private Nikita Shevchenko, who served under contract, was killed by IED explosion in Syria, accompanying food and water convoy. Presented to the state award posthumously. TASS. Conflict intelligence team (Moscow based opposition blog founded by Ruslan Leviev, a Bellingcat contributor) offers some doubts, but not a resolution. (Some other thing have exploded in Syria in those days, indeed...). Two more recent deaths announced, one regular serviceman, Artem Gorbunov, killed protecting Russian military advisers; another a volunteer or private military company member, Ivan Slyshkin killed by a sniper. Official number of deaths stand at 28 at present -kommersant.ru , 6 Mar. 2017. The count includes 4 military advisers killed by IED explosion, Feb. 16, 2016; two others, including general-major Miliukhin, were wounded in that incident. 19 Aug., 2016. Irina Barakiat lived in Syria for 13 years. She was seriously wounded in Aleppo in August 2016. According to report and video, during shelling by rebels, her apartment was hit; she covered with her body a 'balloon' (apparently do-it-yourself mortar shell) protecting her 3 children. She lost a leg and a foot, and suffered multiple injuries, but survived and was evacuated to St. Petersburg. Russia's Mi-8 Chopper Shot Down in Syria, on his way back after delivering aid to Aleppo, Sputnik News, 1 Aug, 2016; There were 5 people on board. Dead bodies were dragged through dirt, Cassad. Apparently one ID card shows a woman. Kremlin reports all those on board Russian helicopter Mi-8 shot down in Syria died TASS (Engl). A video emerged called "Russian military jet has been downed in #Aleppo 01/08/2016". This video is fake, crash sound added later. No smoke, fire, sound, pilots ejecting, etc. Russian Su-24 bombers hit the 1st Coastal Division (Forqat al-Awwal As-Sahli), a US sponsored "moderate rebel" group. The target is an underground bunker with ventilation shafts. See video @1:24 -- Also note cave entrance at 0:30. March 14, 2016. Putin: Russia to 'withdraw main forces from March 15'-TASS (Rus)., (Eng). ; video; kremlin.ru. Hopes it will increase trust and help peace negotiations. (Russian bases in Tartus and airforce base at Kmeimim to continue as usual, has to be fully protected). March 15, 2016. First group of planes left -report, video. March 21, 2016. Russia ready to use military force against violators of Syria ceasefire starting March 22, TASS (Eng). Moscow will use military force if Russia gets no response to its ceasefire control proposals from the United States. "If the Russian Federation gets no response from the United States to these proposals, it will proceed starting March 22 to unilateral application of the rules specified in the Agreement," head of the Main Operations Directorate of the Russian General Staff Sergei Rudskoi said. "We emphasize that military force will be used only after we receive credible evidence of systematic violations by armed groups of the commitments made within the framework of the Joint US-Russian statement on the cessation of hostilities in Syria as of February 22, 2016. Military force will not be used against the groups, observing the ceasefire regime, as well as against the civilian population and civilian facilities", he added. 24 May, 2016. Negotiations with some groups, trying to separate their territory from (clearly) terrorist groups, and ensure that shelling is not conducted from territory of their control, will be continued past 25 May. More SU 24 and SU 34 deployed, 'workhorse' SU 25 attack planes prepared but not moved yet. Rusvesna, 30 Sept 2016. October: Russia moves S-300VM anti-aircraft missile system to Tartus. Its sole purpose is to defend a Russian naval base and warships, the ministry added. Rudskoi revealed that the Russian air group never exceeded 35 aircraft between November 10, 2016 and January 10, 2017. As for unmanned aerial vehicles (UAVs), now Russia is operating about 80 drones in Syria, he added. It’s worth to remember that Russia deployed four Su-34 fighter bombers to the Hmeymim airbase last Sunday, raising the number of such bombers in Syria to 11. Along with 12 Su-24, 4 Su-35, 4 Su-30 and 4 Su-25, Moscow had a total of 35 warplanes of various types deployed in Syria. This number is identical to the number provided by the Russian general staff. 35 RuAF jets including 3 MiG-29s, 8 Su-24s, 4 Su-25s, 4 Su-27/35s, 2 Su-30s, 14 Su 34s, 4 IL-76 cargo planes, 2 IL-20/22s, and 1 An-26 jet. Brigadier Suhail Al-Hassan is again seen guarded by what look like Russian special forces. This page was last edited on 10 March 2018, at 21:35.